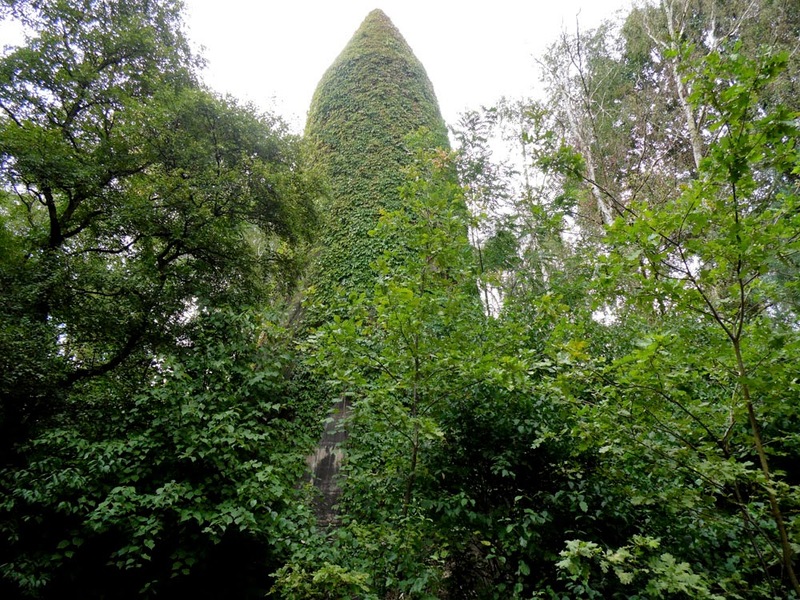 There are strange towers in the forests between Wünsdorf and Zossen, around the former Overall HQ of the German Wehrmacht during WWII. At first glance, they look like towers out of a fairy-tale, lost to the world for a hundred years, sleeping under a blanket of thorns and wild vines. But there is no Dornröschen (sleeping beauty) inside these towers, no Rapunzel ready to let down her hair. In fact, there are no widows to let it down from. These towers are not in the least bit romantic, and are actually Second World War bunkers. There used to be nineteen of them around Wünsdorf, and seven of them survive, some of them incongruously situated right beside modern housing estates. They are called Winkeltürme, after their designer Leo Winkel, and over two hundred of them were built across Germany, They were mainly located at key railway yards of the Reichsbahn and were intended to protect railway employees. 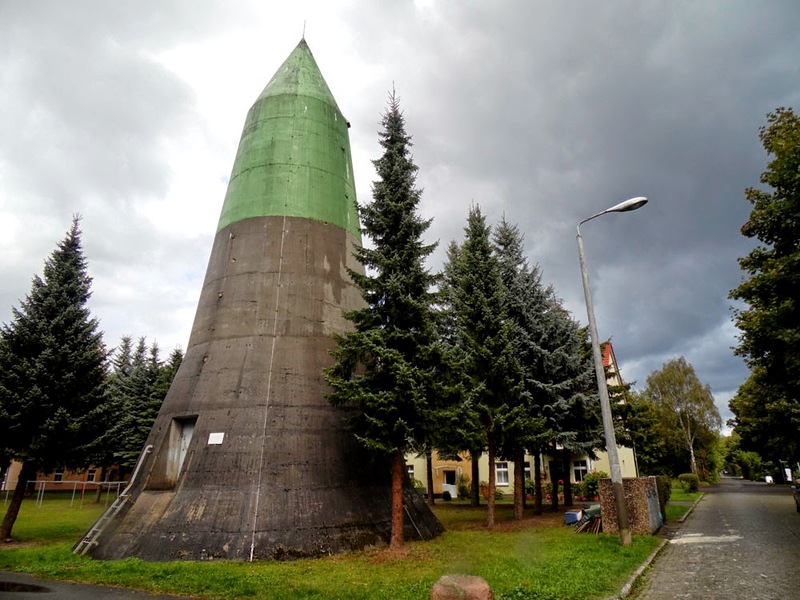 The Spitzbunker design was intended so that any aerial bombs dropped on them would slide off and be deflected away from the tower. Inside, up to six hundred people would be sheltering on a number of levels behind thick reinforced concrete, tapering walls. Their curious shape lent them their popular names of Betonzigarre (concrete cigar) or Zuckerhut (sugar loaf). To the Allied bombers who tried to land a bomb on them they were known as ant-hills. There is only one known hit that destroyed a Winkelturm (at the Focke-Wulf airplane factory in Bremen). There are guided tours (in German only) of the bunkers, and also of the ruins of the nearby Wehrmacht HQ, starting at the so-called Bücherstadt (book town) created out of the former Soviet barracks in Waldstadt. But to be frank, unless you are really really interested in WWII bunker architecture then I wouldn't recommend the journey. For a start, it is quite a walk from Wünsdorf station alongside the busy B69 road (and turn left when you reach the B69 from the station - there are no signs for Waldstadt or Bücherstadt and we turned right and wasted a couple of rainy hours looking for the place). And then when you get there, well, Bücherstadt claims that it is based on the English book-town of Hay-on-Wye, but I wonder if the founders have ever really visited Hay-on-Wye, or even seen photos of it? Let's just say, Wünsdorf is not high on my top one hundred tourist attractions around Berlin, or even my top thousand. I find it curious that this place isn't made more of. I mean, it was from here - right here! - that the entire German Army around the World was coordinated during WWII, right up until the fall of Berlin and the desperate attempts at re-grouping dispersed battalions routed by the Allied Armies. But, after the war it was taken over by the Soviet Army, who made their high command here and had no desire to preserve the Maibach buildings for future historians to pore over. Then with German Re-unification the Soviet Army slunked away and de-populated Wünsdorf as they took their families with them. Good luck with re-inventing themselves as a book town then, though I think they have a bit of a way to go before Wünsdorf gets onto the tourist maps. If you do want to visit the Spitzbunkers, then Wünsdorf is about 45km directly south of Berlin, easily accessible by taking the S2 to the end of the line then getting on a regional train. But then there is the long walk along the B69. I recommend taking a bike along with you. 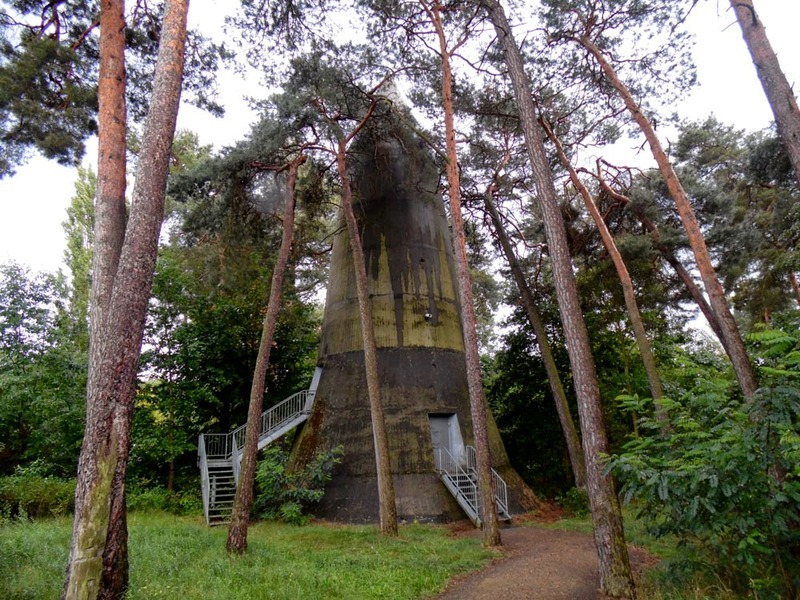 If you want to see a Spitzbunker / Winkelturm closer to home, then there is actually a smaller example in the Kulturzentrum RAW Temple, Friedrichshain, in Berlin. It is now a climbing tower where you can hone your mountain-climbing skills!